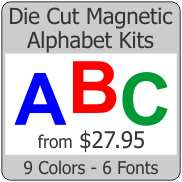 White flexible magnetic sheeting, our most popular item is used for craft and industry. This dark brown rubber-like magnet has a matte white laminate applied that accepts paints, inks, markers as well as objects applied with glue. Our flexible magnet sheets can be screen printed with traditional vinyl inks or digital UV presses. 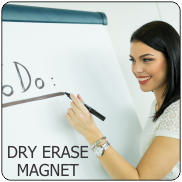 Magnet cuts easily with razor knife, scissors or paper cutter. Magnet is available in 3 thicknesses, lots of sizes and shapes including circles, squares, rectangles, ovals, sheets, rolls and more. The matte white front of this material has magnetic attraction; the back has a peel n stick PSA..
Glossy white surface with standard magnetic backing. Thin material is 0.020 inches, suitable for us..
Glossy white surface with standard magnetic backing. Thin material is 0.020 inches, suitable for ..
Glossy white surface with standard magnetic backing. Medium material is 0.030 inches, suitable for ..
Glossy white surface with standard magnetic backing. Medium material is 0.030 inches, suitable fo..